Hey everyone! I’m doing something a little different this month for my MSN project – instead of sewing for myself, I sewed some stuff for my home! 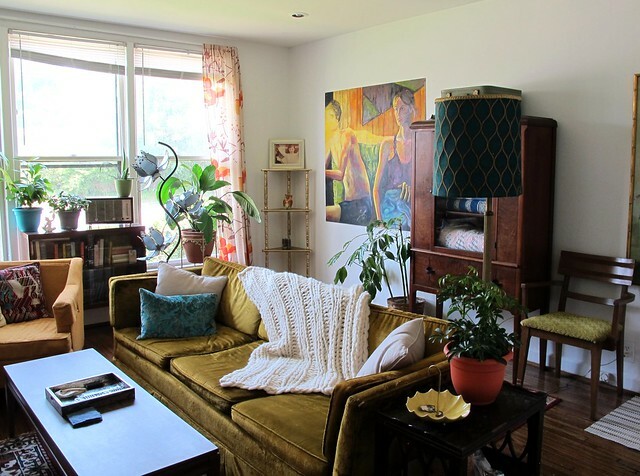 This is about as close to unselfish sewing as I can manage 😉 I just recently moved house (from a basement apartment in the middle of the woods, to a sweet second-floor apartment with masses of windows, in my favorite part of Nashville! ), so sprucing up and decorating were at the top of the list! Plus, I wasn’t sure if I’d have enough time to sew an outfit for myself with all the packing/moving/unpacking (spoiler: I did. I unpacked in 3 days. lolz), so I decided to focus my efforts on getting the new place pretty instead. Not to mention, this gave me an opportunity to actually shop the home decor fabric selection at Mood Fabrics. Yes! First up is a basic (but so useful!) 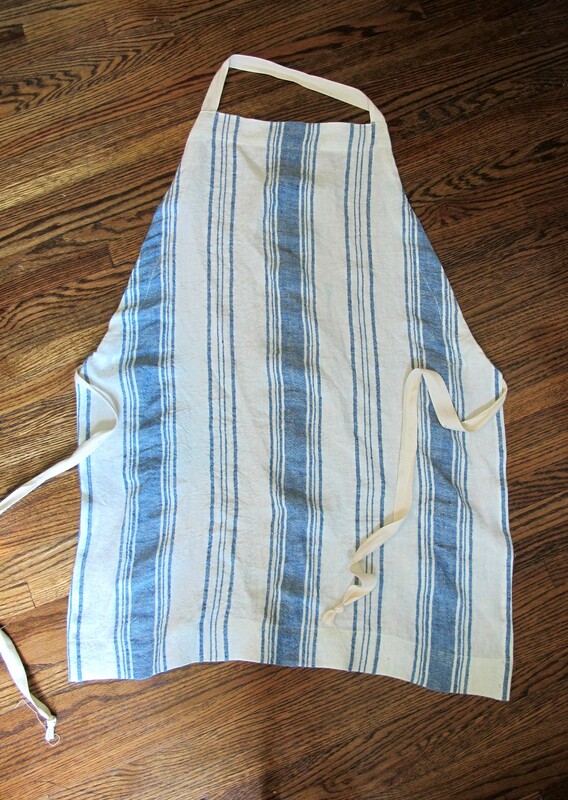 apron, made using this Blue and White Striped Linen. 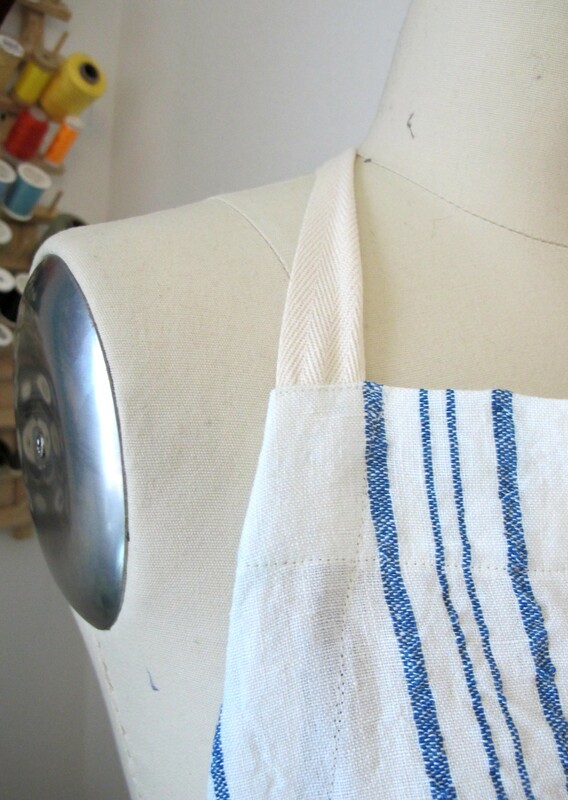 I know, aprons are generally one of those things that people make when they are first learning how to sew 😉 To be honest – I’ve never actually sewn an apron before! 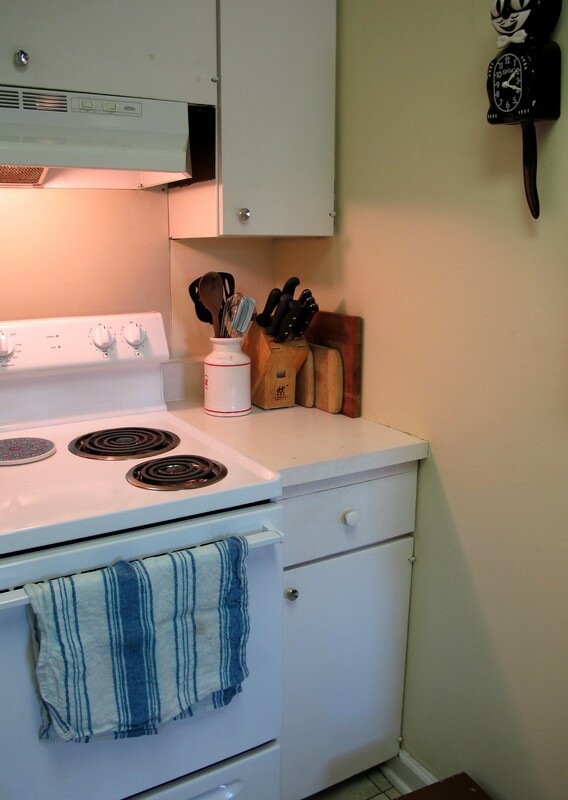 But I knew I needed one because I am a helluva messy cook – like, the kind of cook who tends to rub their dirty hands all over their clothes. Also, I had these ridiculous visions in my head of me cooking super swanky meals while wearing an adorable apron. So an apron it was! 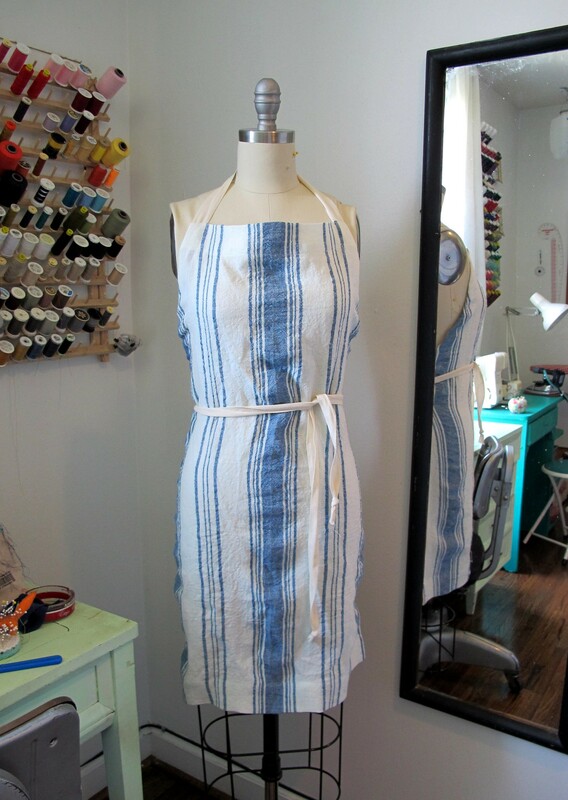 I didn’t use a pattern to make this, just this adjustable Unisex Apron tutorial from Purl Soho. You basically make a series of measurements directly onto the fabric to get your pattern. From there, it’s just a lot of folding, pressing, and topstitching. 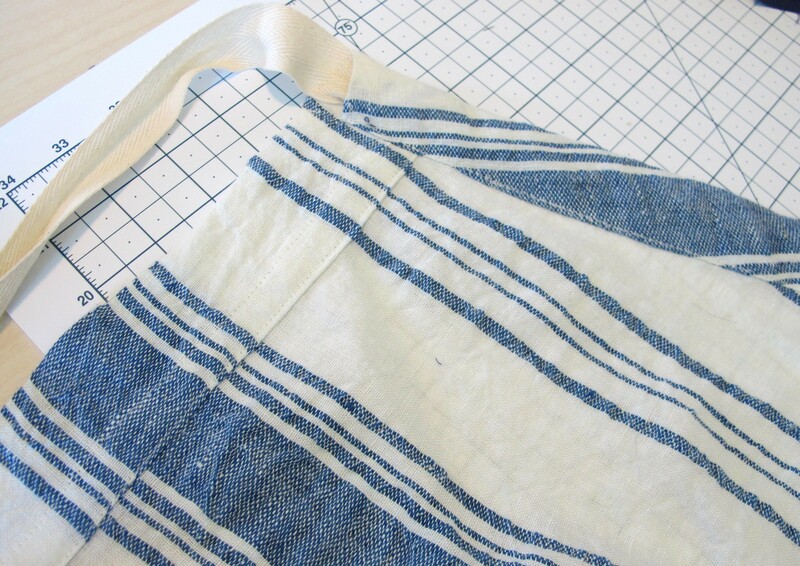 The tutorial was really easy to follow, and this linen was even easier to sew up. 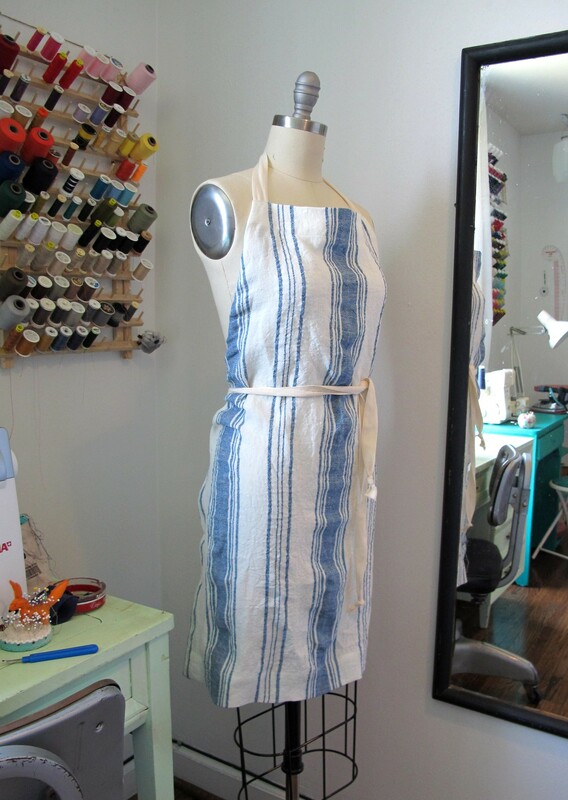 I did find that the straps were a bit too low to hit my waist – so to fix this, I folded over the top by another couple of inches and topstitched it down, which shortened the apron enough so that everything hit me in the right spot. Once I finished with the apron, I realized I had quite a bit of fabric left over (I had bought 2 yards). 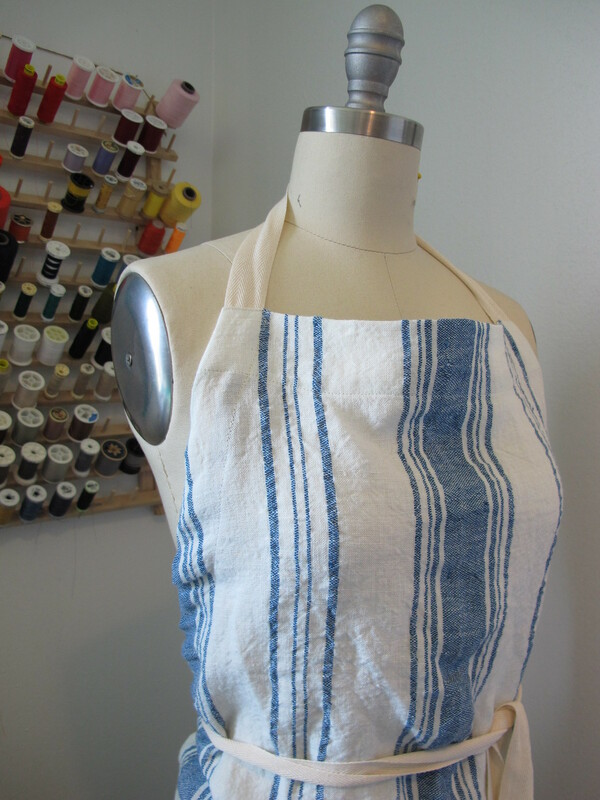 Not enough to make a full garment, but certainly enough for some kitchen linens! 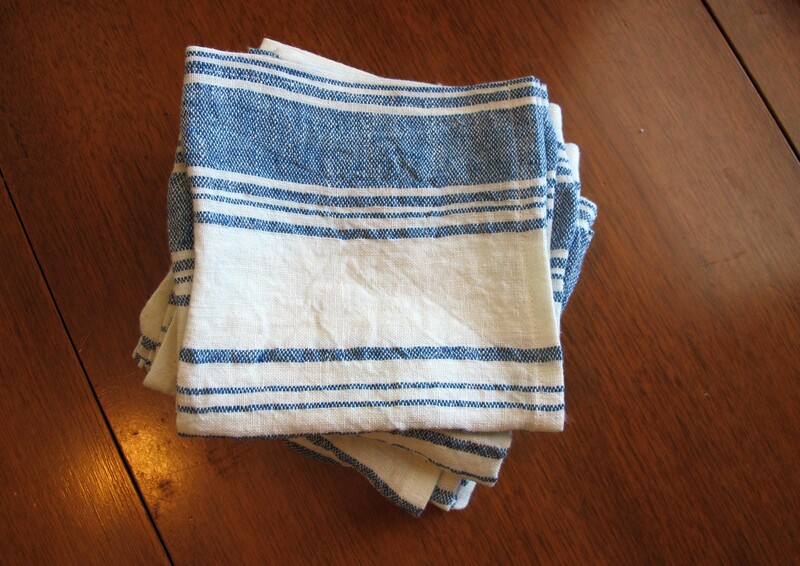 I was able to squeeze out 7 cloth napkins, and 3 dishtowels. Yay! 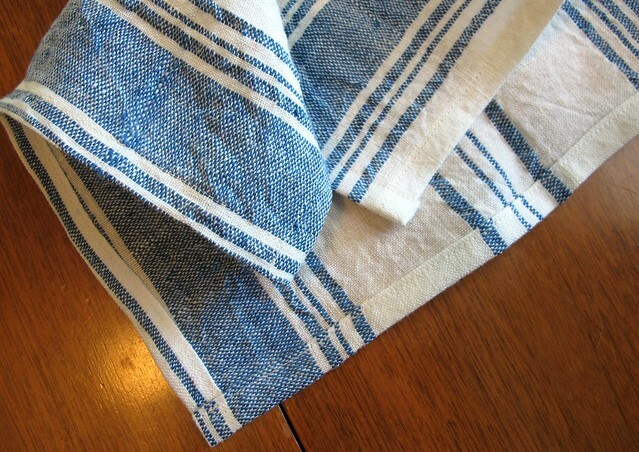 For the napkins (pictured above), I cut 13″x13″ squares (I know there are lots of sizes for cloth napkins, but I personally like mine to be about 12″ square) and folded each edge under 1/2″ twice, and then topstitched. Really easy, and very fast when you sew it assembly-line style 🙂 This was definitely not the most exciting project, but it is certainly useful! I am trying to move away from using disposable products as much as I can, including paper products like napkins. Now, linen does tend to wrinkle up like crazy and this particular linen was no exception! I will point out that it was very stiff and flat when it arrived, but washing it made it soften up very nicely. I actually washed my linen 3x in hot water (and dried on extra hot) before cutting into it, to get it to shrink as much as possible and also because that does help with preventing future wrinkles. As you can see, they still wrinkle when they are laundered, but it’s not terrible. I’ve learned that just giving them a good shake after pull them out of the wash helps a lot. I do put mine in the dryer, however, line-drying will also prevent wrinkles as well. 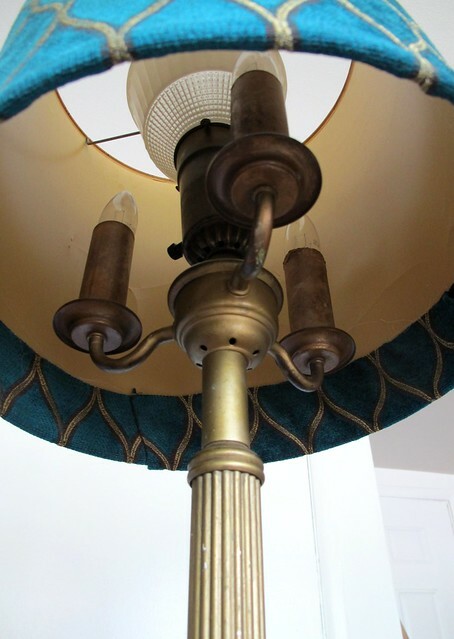 I’ve had this cool gold floor lamp for several years (and my grandpa had it in his home for even MORE years before I got my hands on it), but the drum shade has definitely seen better days. It’s pretty old and brittle – so it cracks easily! I also wasn’t a big fan of the yellow-y off-white color, especially not for my new place. 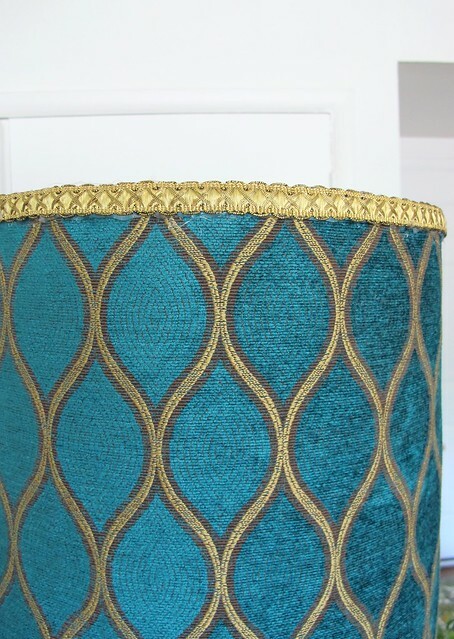 Rather than try to buy a new drum shade (because those things are $$$), I recovered this one! Anyway, covering the shade was really simple! I cut the fabric to be a couple inches taller than what I needed to cover the shade, and then turned under one long edge by 1/4″ and hot glued that to the wrong side of the fabric (since it does fray a lot, you’ll want to cover your raw edges or double turn them). Then I carefully wrapped the shade with the fabric, hot gluing as I went. The edge at the top of the shade was left raw, and then covered with this gold metallic braid. The bottom has an overlap of about 2″ of fabric (the edge with the 1/4″ turn under). When I came back around to where I started, I turned the fabric under 1/4″ and glued it down before overlapping. Done and done! Here is the shade in all it’s glory, in my NEW LIVING ROOM 😀 😀 😀 (psst – see that chair in the background? 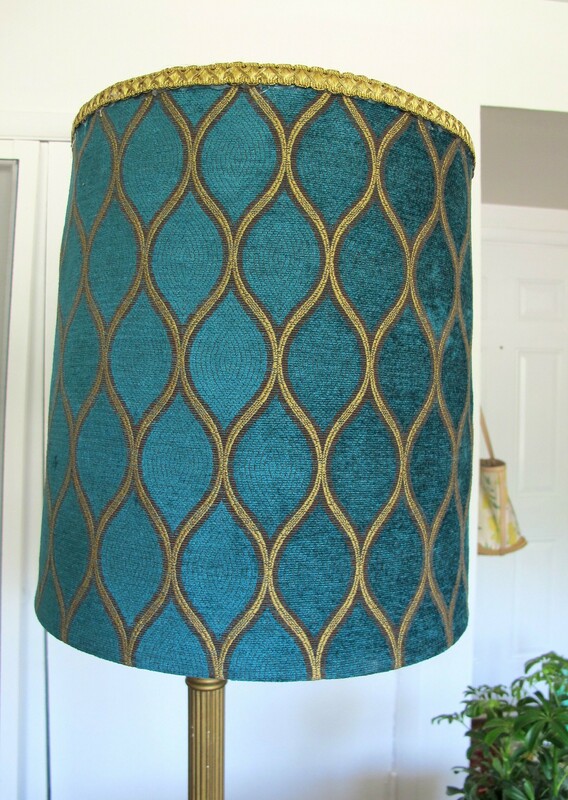 I recovered that bad boy a couple of years ago – also thanks to Mood Fabrics! 😉 ). Ok, so real talk – sewing things for the home doesn’t exactly top my list of favorite things to make, but it’s fun to switch things up every now and then! Not to mention, in a world where greys and chevrons are the current fashion, it’s really nice to have full control over my decor (even if it means I have to be a little bit more hands-on than just throwing something in my shopping cart at Target). What about you? Do you even sew (or hot glue) for your home?